Tonight’s blog post will be shorter but full of detail. We will visit once again with my friends at PillowCubes and then take a peak at items headed to retail. I’m in the middle of producing a bunch of items for the holidays. I’m sitting in the middle of my dining room surrounded by all sorts of materials that can’t remain here on this table. I will be cooking thanksgiving dinner everything will have to go away so it can look like a normal dining room! So I’m trying to push through a good amount of projects and deliver them to my exclusive retailer, Nest of Main in Northport. This way most of the materials can be put away at least temporarily! 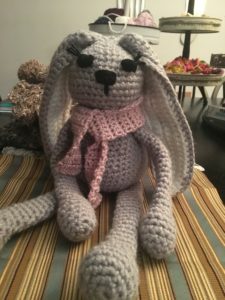 Nest on Main will be doing a child’s gift display in all creamy light neutrals so my amigurumi will reflect that. 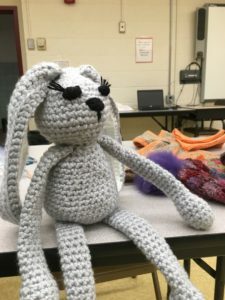 This little one decided to show up for my Monday night crochet class at Kings Park Adult Ed. and now all finished with her trademark scarf! I’m flying through a pretty fair amount of ami in a short time…. 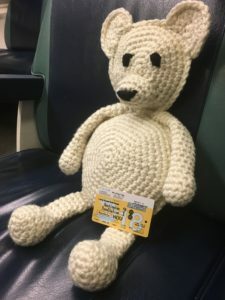 This guy I finished Thursday night on the 6:08 train. My little tradition is that anyone that gets finished on the train gets their picture taken with their (my) train ticket. Polar Bear! She now just awaits his scarf! This piece was inspired by the stuffing. I wanted to use a pillow in a non traditional way. Her body is an 8 inch round poly fill pillow insert from yup you guessed right… PillowCubes ! I’m currently in the process of reupholstering a foot stool and a child’s rocker also in the same creamy colors. They are both in the ugly stages right now. Rocker is being glued and foot stool is half painted. I have high hopes for both pieces. I’m looking forward to finishing at least one this week. Promise lots more to come!!!! Furniture, jewelry and crochet, oh my! Have a great Sunday night and a great week to come!